There is widespread abuse of the elderly in residential living facilities, most particularly with the onset of bed sores. Many of the elderly are immobile because of illness, limb fractures or advanced age. Because of that condition, it is imperative that the resident of a nursing home facility document the person’s medical condition and act on that appropriately. That means that on admission the family advocate for the loved one by insisting that bedding, mattresses and wheelchairs be designed to meet the resident’s medical condition. Bedding and mattresses can be designed so that the resident is less likely to contract bed sores because of inability to voluntarily rotate or move. Without movement, the pressure from lying in fixed position can very often lead to bed sores. There is no getting around the fact that America is growing older. In fact by the year 2050, it is estimated that 20% of the population will be 65 years old or older. By 2010, the percentage of those over the age of 65 had advance to 13% of the total population. What these numbers have unfortunately also meant is the rapid increase in the number of the elderly, infirm or disabled becoming victimized by nursing home and long term care facility abuses that include the onset of bed sores. The nursing facility employees, nurses and nurse’s assistances must be experienced. They must know that each resident is different from the next. That to prevent bed sores or skin ulcers, the resident must be hydrated, regularly bathed and given healthy choices of food and fluids. Some residents need heel protectors or a kind of boot to prevent bed sores from arising from the constant pressure on the ankles and heels. 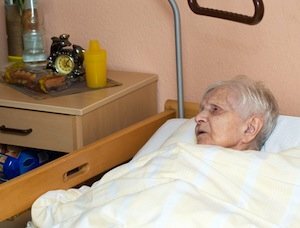 Over the last 40 years, Robert Kreisman of Kreisman Law Offices has been handling nursing home abuse cases, including those who are afflicted with bed sores. Under the Illinois Nursing Home Care Act, Illinois nursing home residents have protection provided by this Illinois state law. If you or a family member has developed bed sores in a nursing home facility, please call Robert Kreisman at 800.583.8002 for a free consultation. Bed sores often develop in nursing home residents who are infirmed, who are unable to walk without assistance and are recovering from injury, such as hip or leg fractures or illness. In many cases, the nursing staff are unaware of the resident’s condition, are unable to care for the person or because the residence is understaffed or are otherwise indifferent. Bed sores are extremely dangerous because they are openings in the skin that can lead to infection, sepsis and death. Some bed sores can become so extreme that they cause bone infection, resulting in limb amputation or infection leading to sepsis and organ failure. Bed sores often arise on the sacrum, tailbone, low legs, ankles, heels and elbows because nursing residents who are immobile are left in a lying or sitting position without rotation or repositioning by nurses, RNs, CNAs or other staff aids. Without immediate and careful medical attention, the bed sore can become a very serious health issue. Wound care is essential for those suffering from bed sores. Most nursing homes are able to reliably treat at least stage 2 bed sores. Bedsore or pressure sores are one of the most prevalent signs of nursing home abuse. It takes time for these sores to develop. The sooner the openings to skin are treated, the better is the recovery. Bed sores are scaled in terms of their severity. The stages of bed sores are based on the depth of the wound. The least serious stage is 1, with most serious bed sore scored at stage 4. Most staged bed sores or also known as decubitus ulcers are found to originate over a bony structure of the resident’s body. Because there are many kinds of nursing home abuse, loved ones, family and friends of a nursing home resident or long term care resident must be diligent about signs and symptoms of abuse, including the onset of bed sores. Try to make as many visits at different times of the day or days of the week as are possible. That way your observations of possible signs or symptoms of abuse can be recognized, called out to the nursing home administrator and the resident-loved one treated appropriately by a physician if needed. Kreisman Law Offices has been handling nursing home abuse cases in Chicago and its surrounding areas for more than 40 years, representing individuals and families. Contact our offices at 312.346.0045 or 800.583.8002 for an immediate free consultation, or fill out a contact form.